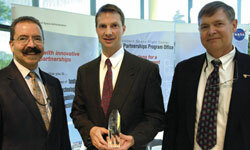 Glenn Rakow (center) received the 2007 Kerley Award. Pictured with AETD Director Orlando Figueroa (left) and NASA Chief Engineer Mike Ryschkewitsch (formerly GSFC Deputy Director). This is an annual award given by the Strategic Partnerships Office to GSFC civil servants who has been instrumental in transfer technologies. The Kerley Award is named after James Kerley, a champion of technology transfer.